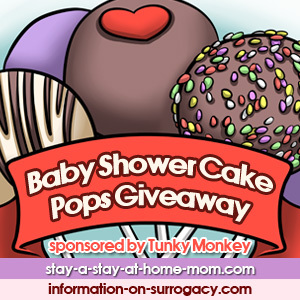 It’s time to celebrate baby with a fun treat for the baby shower: Tunky Monkey’s Cake Pops. Winner will receive Pick your Treats for your Sweet Mother-to-Be, up to $100 in cake pops of winner’s choice, including shipping. All fees collected go towards the costs of promoting this giveaway on external websites and/or towards the next giveaway event. Information on Surrogacy does not take any sort of profit from fees.